The first time I rode an e-bike was probably about 7-8 years ago. I thought it was pretty cool, but I'll be honest, at the time I wasn't really grabbed by the idea (it probably didn't help that, at the time, they were more expensive, heavy, and had very limited range). At some point this year, I started to pay attention to e-bikes. After watching countless YouTube videos of people doing their own builds, I finally took the leap. I wanted a bike that was reasonably "stealthy" (could easily be mistaken for a normal bike), powerful enough to be on moped terms, yet still able to be operated like a bicycle. Originally I intended to buy a conversion kit, and spent about a month researching reviews to figure out which of the many options I should pursue. The process was suddenly abbreviated when I found a Craigslist ad for an already-converted bike. It was 48V, 1000W, right in the area I was looking for. 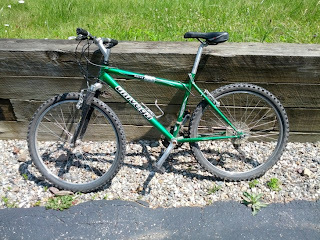 My trusty old steel frame mountain bike. Upon getting the bike home, I determined that beyond the motor, controller, and battery, there wasn't much of the bicycle itself that was worth keeping. The pedals were stripped, the crankset was cheap plastic and wobbled, the disc brakes would not adjust, and some other problems. Even on the electrical side, the battery management system had had some kind of fire, and there were melted leads, connectors, cheap fuse holders, and other issues. Cannibalized frame. Anyone want a Chinese mountain bike? 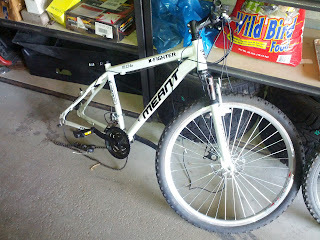 I had my trusty old bike who I had just decommissioned in favor of a lighter bike (which was to remain conventional). The Univega Rover 303, known for being very rugged (albeit heavy), steel framed bike. It was the perfect candidate. In about 3 hours I had swapped the motor, controller, throttle, rack/battery, etc. over to my bike. Ran into a few snags, but nothing too bad. I had to slightly widen the frame at the rear axle, and the throttle wouldn't easily fit with my gear shift. I then rewired and installed serious connectors, fuses, and made everything safe and reliable. Presto, the whole thing is now ready to go. Converted! The small bag in the center is the controller, and the panniers hold the battery. It does 30 MPH, range is somewhere around 40 miles. 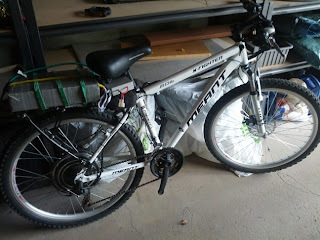 Since the build, I have taking daily rides, and getting familiar with it, and ironing out the little details. 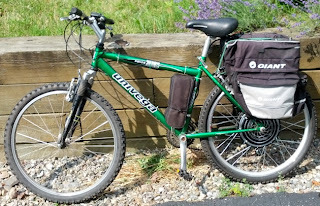 Things like getting a kickstand that can support the extra weight, a serious bike lock that stows away, a powerful headlight, better seat, gloves, etc. These things all matter 10x as much when you are going fast and far. Most of the trips I have done are between 20-30 miles round trip. Just exploring the area around Shelburne, Hinesburg, Williston, and thereabouts. Eventually, I'm planning one long trip out to my folks house, which will be about 50-60 miles round trip (charging required). I'll try to post some recaps of some trips and what I learn/experience. All-in-all, e-biking is incredibly fun.